An award-winning worship leader continues to generate controversy after revealing that he no longer accepts the Genesis account of creation as being literal. Michael Gungor and his wife Lisa, who in 2006 formed a congregation called “Bloom” in Denver, are known for their the Dove Award-winning and Grammy nominated worship music, such as Beautiful Things, Say So and Dry Bones. In 2013, they won an award from the Independent Music Awards for their live performance album A Creation Liturgy. But in 2012, Michael Gungor, the son of pastor and author Ed Gungor, revealed in a blog post entitled A Worshiping Evolutionist? that he had concluded that the Genesis account is only figurative. “I guess I’ll have to come out of the closet and admit…no, sorry kid, I don’t believe in a literal six-day creation,” he wrote. Upon posting the blog link to Facebook, fans were divided, with some expressing support and others feeling deep disappointment. “[Creation] matters for one reason alone: If there were no First Adam, how could there be a Second One?” added another named Jon. But earlier this year, Gungor revealed his thoughts even further, explaining in a blog post entitled What Do We Believe? that he “has no more ability to believe” in Genesis as being literal. 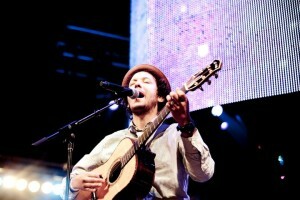 Now, Gungor is involved with a collaborative project called The Liturgists, which features controversial author and speaker Rob Bell, singer Nichole Nordeman, writer Rachel Held Evans and others, who characterize themselves as being “decidedly Christian in practice.” One of the EP’s, entitled God Our Mother, explores moving past seeing God in the masculine, but also as a motherly, comforting figure. “God our Mother/Leading us into peace/Drawing and comforting all those in need,” the song rings out. “This meditation will consist of a series of phrases. The first will be a positive statement. Something like ‘God is our Father.’ … The second phrase will be a negation of the first: God is not our Father. The word father applies to a human male who either raises a child, contributes sperm for conception, or both. This is not the case with God,” it outlines. Word of Gungor’s direction continues to sadden some Christians.